Don’t you just hate those really annoying spots that are the size of Mount Vesuvius and feel so bruised and sore, like it’s going to erupt at any moment and cause an earth quake. I have had the same one for MONTHS now and have only just managed to finally get rid of it after nailing my skin care. These horrible little creatures like to burrow somewhere along your chin when it’s ‘that time’ of the month to make you feel so much better about yourself. The reason they are so painful is because they are located deep under the surface of the skin and are close to the nerves making them very red and sore. To save you the time, hurt, redness and money I thought I would be kind and share my 10 steps on how I got rid of them for good! DON’T PICK – this may seem like an obvious one but so many people make this mistake. By picking, squeezing or god knows what else you can do with it you’re likely to make it sore and much worse in the long run. Think of all the bacteria... eeeewwwwww. To help speed the process of it coming to a head, try putting a flannel in really hot water (not so hot you end up burning off your skin) and place it over the top for a while. Doing this morning and night helps shift it along. Take off your makeup properly. Another simple one that you should already be doing. It’s so easy to just use a makeup wipe and dive into bed (trust me I’m a fan), but it just doesn’t help the cause. If I am going to use a wipe I’ll make sure I use a face wash afterwards as well. That was a good link, now onto facewash. I picked up the new Body Shop 3 in 1 tea tree wash in hope that it would solve all of my problems and it definitely played a big part. You can use this as a wash, scrub or mask depending on what you fancy; I mainly use it as a wash. 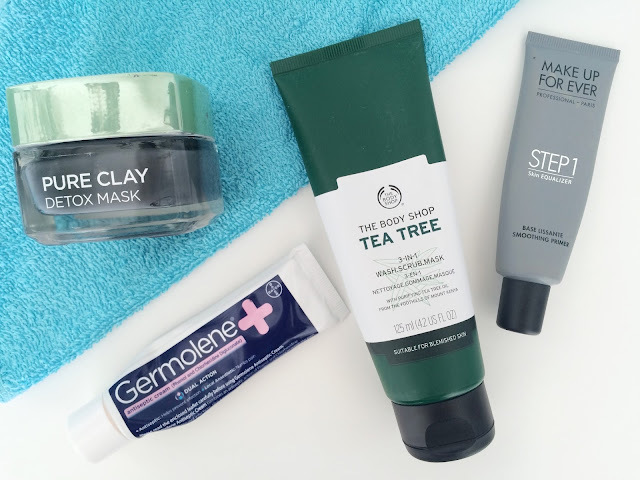 The thing I love about tea tree products is that you can instantly feel it getting down to business; The fact that it’s a Body Shop product just makes me even happier. As I have sensitive skin I always feel safe when picking a Body Shop product, plus the staff in Plymouth are always amazing. Before bed I use good old Germolene on the spot to soak in overnight. Word of warning, don’t use it before your makeup as it makes everything congeal! Germolene is an antiseptic cream which helps clean the area to prevent any infections as well as soothing the pain. My family have used this for everything since I can remember… My mums favourite answer to any dilemma is to put some Germolene on it. Once a week I also like to use a clay mask to pull out any impurities. I’ve been using the new one from L’Oréal which has been great. Again it doesn’t react with my skin and I feel like it helps reduce the size. Due to having to cover up the blind spot with makeup I like to try and make sure there’s some sort of barrier between the foundation and the skin. I’ve been using the Make Up Forever Smoothing Primer. This helps create the barrier as well as making sure my makeup stays in place so I’m not having to cover up throughout the day. Wash your brushes regularly – I HATE washing my brushes it’s such a boring and long task. The first thing I usually do though when I have a breakout is wash the brushes. It’s important to keep up with it as all the dirt and bacteria just builds up and then you end up smearing it all over your face, which is not what you want! Drinking more water and eating a bit better can really help make all the difference, working from the inside rather than from the outside. Last but not least it’s important to keep up with your routine. There’s no point finally getting clear skin nailed to then go back to your old ways! I hope you find this post helpful and you've had a great weekend!